Imagine how much time you would save if you woke up with perfect lashes. No need for mascara for other eye makeup -- your lashes can look perfect from the minute you wake up to when you go to sleep. How? Helen’s Haven offers eyelash extensions services. Eyelash extensions are a semi-permanent version of the false eyelashes you may be used to. The eyelash extensions are glued on to your real lashes, leaving you with no-effort voluminous lashes. How does it work? Keep reading to find out everything you need to know. Before your appointment, it is important to make sure your skin is completely clear. That means no makeup, especially near your eyes. Your eye area needs to be totally clean and bare to make sure that nothing gets in the way of your lash application. Also, remember that your eyes will be closed for a few hours when you get your first full set. You can listen to music or a podcast if you want to. You can even take a nap! Just be prepared to have your eyes closed for an extended period of time. During your appointment, you and your lash technician will determine the best type of lashes for you. There are a few different size, curl type and length choices. Generally, it’s better to start small for your first set. You can always work your way up to Kardashian-style lashes over time. For now, it is best to go for a more natural look. Once you decide on the type of lashes you want, your stylist will begin the process. This involves glueing the fake lashes to your real lashes. The glue is 100% safe and the whole process is totally painless. This is your time to relax! 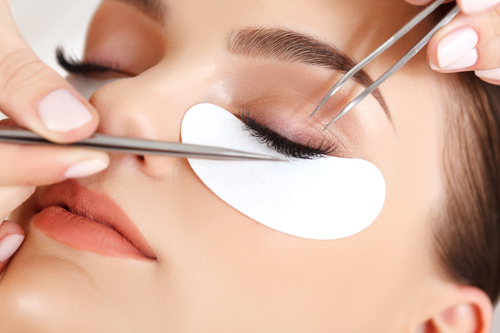 After your appointment, you must take the necessary steps to make your lash extensions last. How long they last is really dependent on how well you take care of them. The first and foremost rule is to be careful not to wet your lashes for 48 hours after application. Wetting your lashes will break down the glue attaching them to your real lashes. Also try to avoid wearing any eye makeup. If you do choose to wear it, use only water-based formulas. All makeup remover and skincare products must be oil-free as well. Don’t worry if your lashes begin to fall out a few weeks after application -- that’s supposed to happen! You can get a refill every 3 to 4 weeks to keep your luscious lash look. Another golden rule? Never, ever pull the lashes out on your own. If you need them removed, your stylist can do it for you safely.